Thanks Lazaro! I passed this building from the other side, hoping it wasn’t locked up. Only one door and that was it. Really wanted to get inside there! Crucifixion of the Trinity ? It actually took me a little while to understand what you meant. But that’s an interesting observation, I never looked at it like that! Thanks for your comment, Carl! I like the wild, out of control look here. Great! Someone wanted a trellis for the vines, but forgot the door was there? Great photo! Wonderful photo – and a perfect title. 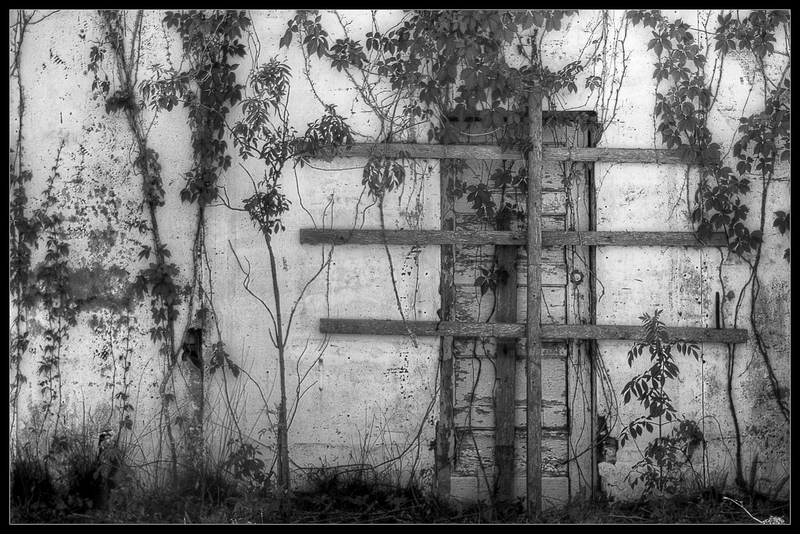 I like the contrast of the growing vines and the blocked door – wonder what it used to be for? Thanks, Lois! I wonder also, the building was fairly large – but this was the only door I saw on all sides. I thought that was pretty odd. No way in, or no way out? Yeah, no kidding! When I was trying to think of a title, I almost used “In (or out? )” because I was thinking the same thing. Thanks, Christina! I really enjoyed your latest post “Signs of Life, A Creepy One”, what a great find and well documented! Thank you Robert! I am so pleased that you enjoyed it. Really like the patterning in this one. The hard lines of the trellis and the softeness of the vines. A curious place..